A friend recently shared a news report about a school community debating the teaching of mindfulness in the school, some thought it was a great idea whilst others did not want it shared with their children. It was a fascinating piece to read. I think perhaps there was a little of the fear of the unknown playing in the minds of some so perhaps there was room for further explanation and sharing of research to support the adopting of the practice. Who knows and it's not my place to be debating the rights and wrongs of that particular school issue but it did get me thinking about mindfulness in our schools and if there is a place. For me mindfulness is about being aware of our own thinking and bringing ourselves into the present moment so we can fully engage in what is happening right now rather than worrying over what has happened or might happen. I am no expert in the field at all but I thought I would share some ideas that I have from my perspective as a parent and teacher. I have been thinking about why mindfulness is an important habit for our children to learn and then about how we could create opportunities for developing and practicing mindfulness in our busy school days. Why focus on mindfulness in our schools? And the potential good news is not only for our children, their mental wellbeing and their learning... it has the potential to help teachers too! 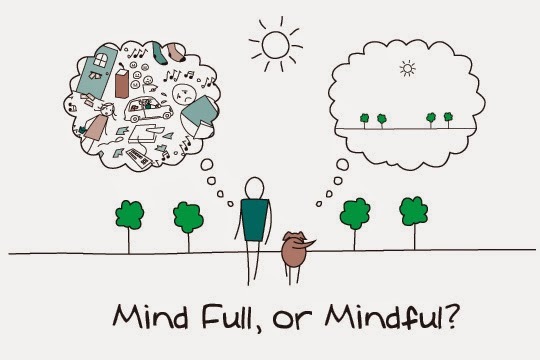 If we practice mindfulness with our students we could enhance our own health and wellbeing at the same time as creating a healthier, more harmonious working environment for our students, colleagues and families. There is a lot of evidence to support mental health benefits for adults with mindfulness. It is great to see some research being done in the field of mindfulness in education to support the practice and offer a road map for future progress in schools. Check out this link for one useful paper about the process written by Grant Rix from NZ Mental Health Foundation with a focus on the NZ context. How to encourage mindfulness in our schools? There are a whole range of techniques that I believe could be used to enhance mindfulness, many of which are about calming down the chatter inside our minds. relaxation- a mentor from my teachers college days took us through a muscle relaxation exercise which I know still helps me to relax my body and mind at times. Basically you lie on your back and systematically tense different parts of your body then release them starting from your toes and working your way up the body (so you scrunch your toes up tight and then release, do this two or three times then move into tensing up your feet and up the body). The focus is on feeling the tension release when you let go. visualisation- when I have dozens of things spinning around in my head I sometimes need to stop, accept them then let them go and I have found visualisation really helpful. There are several that I use and have used with children as well, here are a couple. Imagine you have walked through a forest and you come to a deep clear pool in a clearing, it is warm and safe, around the pool are big round stones, as you pick each one up imagine something that is worrying you and write it on the stone, then let the stone drop into the water, watch it float to the bottom, you can pick that worry up any time you want but for now it can stay there. Another one is walking down a hallway with lots of doors and putting my worries or concerns into each door and shutting it before going through the end door where the room is empty. There is also the balloon idea, which can be done physically as well as in your mind, imagine blowing up a balloon, each breath you put in something that is worrying you, when it is full, tie it off and let it go, watch it float up into the air and away. being grateful- I know that this seems to be creating more to think about but every so often, stopping and working out what I am grateful for right now helps to even things out and bring me back to reality when I am getting bogged down with negative thoughts. having down time- if we are always moving from thing to thing to thing without finishing something off or having down time then there is no space for mindfulness... and it is stressful for our learners. We need to be able to wrap something up before shifting to the next thing. I do think that integrated learning helps create flow and seemlessness which makes the shifts and changes throughout the day more organic. I also think summarising our learning, reflecting on it if possible, before we move on can help create that space as well. juggling- giving your brain a repetitive task that takes your focus and attention to complete helps to quieten the extraneous noise as well. I taught one class to juggle at the start of the year and they did really well, it was amazing how focused some students became. It works with other tasks like knitting. I found earlier this year making a pom pom with my little boy incredibly calming. It is about being present with that task however, rather than multitasking... in fact it can be an opportunity to practice letting thoughts come and go whilst staying focused on the task at hand. maths, I used a children's book of yoga positions (Isabelle Koch- like a fish in water) and we would do 4 or 5 positions most days sometimes with music sometimes without. It was amazing the calmness that would descend over our classroom, for myself and the class. The focus was on breathing and moving slowly. focus on our senses- mindful eating is one suggestion that comes up often, it is focusing on the whole experience of eating our food, smell, see, taste and even touch. When you go for a walk outside focusing on what you can see that you might not have seen before or what you can see, hear, smell right now can be helpful, it is all about bringing your attention to what is happening in the here and now. It amazes me with what my little boy notices when we are out and about that I haven't spotted. As an aside: I do wonder if when we start 'educating' children that we inadvertently unlearn their natural sense of mindfulness, if perhaps we create more internal 'chatter' or bring in more distractions (think about our classroom spaces for example, are they visually noisy?). Do we often demand that they focus on what we are wanting them to right now when they are actually fully engaged in something else? Might it be best for our children to adopt a mindful pace? This education isn't only what happens in classrooms either. There is much to consider. I guess in my way of thinking I wish this wasn't something I had needed to learn (or perhaps relearn) as an adult and perhaps having opportunities for our children to practice mindfulness in our schools will help us all.